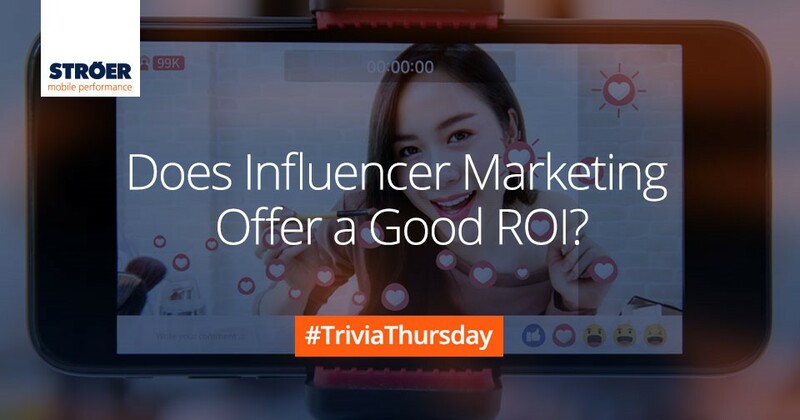 Trivia Thursday: How good is the ROI for Infuencer Marketing? How Good is the ROI for Influencer Marketing? It has proved to be more than a short-lived trend. Influencer marketing has grown to be a real market. 5 to 10 billion USD, that is the forecast market size as reported by mediakix, who are of course partial as a player from the field. We also experience a sustained demand for influencer marketing solutions – in our case paired with the logics of mobile performance marketing & app marketing. However, the question is: Does influencer marketing offer a good ROI? Is the return on investment worth entering this sphere? After all, it’s not cheap to have influencers introduce products, services, software or opinion. Previously on Trivia Thursday: How relevant is mobile ticketing? In that same story, marketers explain that measuring the ROI on influencer marketing is “the biggest pain point”. The Influencer Marketing Hub recently also delivered interesting numbers its Benchmark Report: Comparing influencer marketing campaigns with paid advertising, the ROI was seen way above par. “On average, campaigns focused on branding or engagements saw an 8x ROI”, is one of the interesting findings. However, it always depends on what you want to achieve. For instance, a study by NeoReach is cited. It came to the result that ecommerce campaigns deliver a negative ROI (.80 USD for 1 USD spent). However, the branding effect was not calculated. If you would like to understand what role influencer marketing can play in your mobile performance and mobile app marketing activities, please contact our Head of Sales, David McTaminey.